From May 14 to 19, 2016, the Scarborough Needlearts Guild exhibited members' works as part of their 40th anniversary celebration. Luckily, many of those attending the EAC Board Meeting prior to Seminar were able to attend the exhibit titled "Art of the Needle." 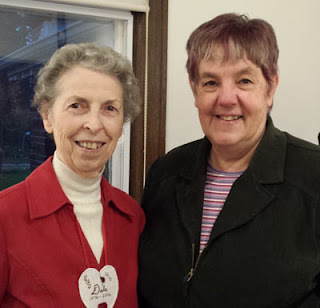 Some got to see familiar faces, some got to meet people they've read about in Embroidery Canada, and some got to meet stitchers they have exchanged Christmas ornaments with in the past! It was a beautiful exhibit with an exceptional range of works and techniques. 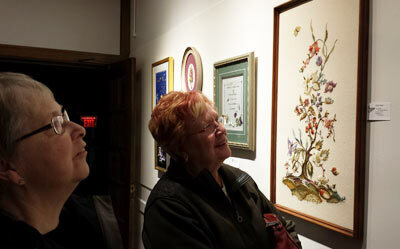 There were many guild members on hand to talk about the pieces on display and the guild. From traditional to contemporary, it was very inspiring to see many original designs as well as beautifully executed stitching on some familiar designs. One of the pieces was the "Tree of Life," of provincial flowers design by Fran Oakley and donated to the Winnipeg Embroiderers Guild as a fundraiser for EAC's first seminar in 1975! Sheila Stewart and Beryl Burnett admire "Tree of Life"
Find out more about this beautiful crewelwork design and download the instructions and pattern on the WEG website. 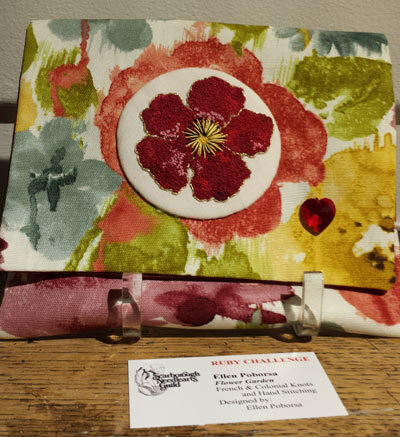 Another familiar image was featured on a small fold-over bag that was entered in the "Ruby Challenge" by EAC member, Ellen Poborsa. Ellen's piece, "Flower Garden" features the rose pattern that many members are stitching in a variety of techniques for EAC's roses display. Ellen's rose is very rich, featuring colonial knots and French knots stitched in a range of red threads, outlined with couched gold thread. The variety of knot and thread sizes gives the rose enticing dimension. Find the rose pattern and more about the roses display on the EAC website.